Nothing new, same story every time ;-) I think, whether or not you're a working bee, you just have to give in. At the latest when your body calls for it and says: STOP! Your body will force you to go to bed, to rest and to yes, stay there for a bit... It's always hard for me to admit that I didn't get enough sleep the last few weeks and then, to really take my time to rest. This is my Go-To-Water whenever I feel sick or have a cold because lemon will detoxify your body and ginger will cure your illness. My mum always tells me to drink lots of hot ginger water and you can even eat a small piece of raw ginger to help your throat. Read more if you want to know why you should drink warm water with lemon. As always, fuel yourself with lots of fresh vegetables and fruits. Especially right after the holidays when I ate heavy food, I'm longing for something light and fresh :) That's why I made myself a Green Juice yesterday. 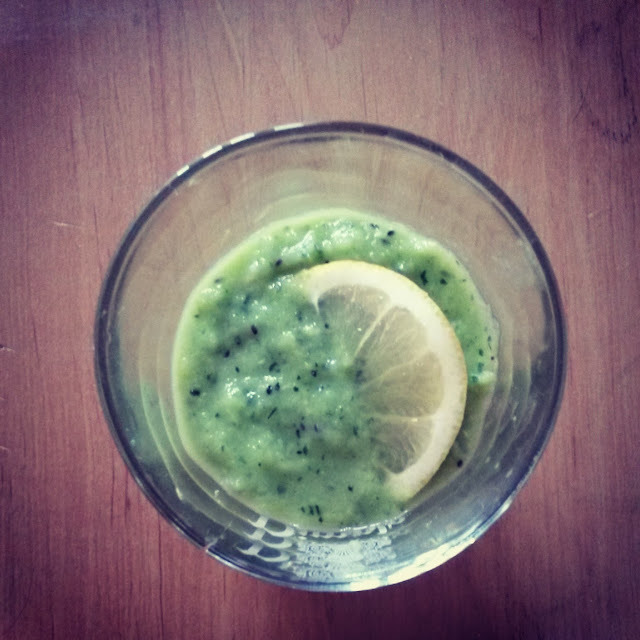 It's so fast to make your own, for instance this one consisted of a kiwi, half an avocado, some zucchini, a few slices of lemon, some ginger et voilá you'll have your dose of vitamins and essential nutrients :) Read more about Green Juices here. Go out, have a walk, not a jog ;-) and let the sun shine in your face (if there's some), breathe in some fresh air and be out in the woods, your body and mind will thank you for!